Description: In Care-full Preaching, G. Lee Ramsey, Jr., offers a new vision for how sermons can energize all members of a congregation to care for one another. Using fresh images and sermons from Fred Craddock, James Forbes, Gina Stewart, Barbara Brown Taylor, and himself, Ramsey demonstrates in practical ways how sermons can create a caring community. Endorsements: "Many preachers think of pastoral care and prophetic witness in the social world as two separate ministerial activities. 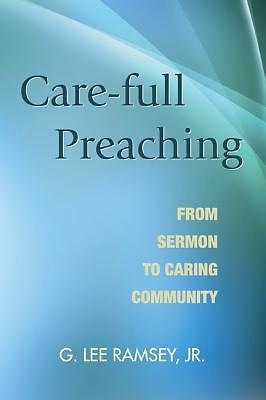 Drawing on the most current theories of pastoral care and the most perceptive analyses of Christian social vision, Ramsey presents a practical approach to preaching that develops caring communities for bold prophetic witness. The result is preaching that nurtures congregations in which people care for one another and for the world." Ronald J. Allen, Christian Theological Seminary "This is a fine book. Ramsey faces the problems of contemporary pastoral preaching squarely and comes up with some surprising finds. Not only are there fresh resources for caring preaching right there in the church's own backyard, but Ramsey has a very good map of the terrain. He is an excellent guide--thorough and thoughtful. With his help, new and deeper wells to fund our preaching turn up right under our noses." Jana Childers, San Francisco Theological Seminar About the Contributor(s): G. Lee Ramsey, Jr., is Professor of Pastoral Theology and Homiletics at Memphis Theological Seminary.